Hey Mom look , i can Fly ! 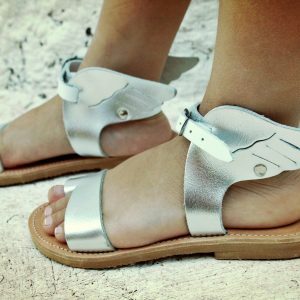 Genuine and unique leather sandal in silver winged Hermes style . Subtle shine and comfort leather compose this amazing Greek sandal . Slip into our playful World , a kid could think ! Crafted from genuine tan leather leather , this pair features a playful fringe trim at the ankle strap. Style is finished with a pom pom trim and toe ring friendship bracelet to enhance its lovely look. Little girls are sure to love these animal print Sandals. Crafted in leather for an enjoyful wear all over the summer days ! These leather sandals feature a white strap around the heel with a silver glitterry Crown on Top , and a glittery silver strap that sits over the toes providing a girly finish. This minimal sandals are perfect for every occasion ideal paired with a loose white summer dresses.